523. COBHAM to [? BURGHLEY]. 524. COBHAM to [the SECRETARIES]. (1) "Extract from a letter written by M. de Lapret to M. de Bonele, first chevin of the city of Ghent, 22 Dec. 1580." A peasant of this neighbourhood came to see me this morning, with a note recording how a gentleman of M. de Montigny's said at Lille the day before yesterday that that gentleman had a design either on Bruges, or Ypres, or Menin ; and that in fact he has drawn a good number from the garrisons in this neighbourhood. I sent the note at once to his Excellency [Prince of Epinoy], not having leisure to go myself by reason of pressing engagements. No more to write to you. (2) The note referred to above. To M. de la Pr or M. la Cappelle, to let them know that today, the 20th, some friends heard in the town of Lille, from a gentleman of Montigny's, that some treason is toward against Bruges, Ypres, or Menin. He would not say the last (sic), saying that his oath was concerned in it. (3) The Prince of Epinoy to the Four Members of Flanders. 526. THE MERCHANTS ADVENTURERS to WALSINGHAM. By letters from our brethren in London we learn your request for the admission of Mr Alderman Martin into our society. Which being propounded in our general Court, and there weighed and debated, was for sundry respects found very dangerous and prejudicial to the state of our fellowship. Nevertheless, considering how ready you have always been to further our cause, and what good turns we have from time to time received at your hands, we thought it our part to have more regard in this to your desire than to our own commodity ; and therefore devising some way that might both satisfy you and meet the inconveniences that are otherwise likely through his admission to pursue us, we have willingly consented to receive Mr Martin into our fellowship, so far as it may please her Majesty and her Council to direct two letters to us in the nature of the two copies enclosed. Without these we see ourselves as it were disarmed against divers assaults, and a way opened to let in all those that seek by the like means to enjoy the benefit of our freedom. We doubt not that having considered the grounds of this request you will not only judge it reasonable, but also very necessary for the preservation of our general corporation, and trust that as you have heretofore been in a manner our patron and defender, you will now and hereafter extend towards us your favourable assistance. Antwerp, 24 Dec. 1580. (Signed) Christopher Hoddesdon, Governor. (1) From the Privy Council. 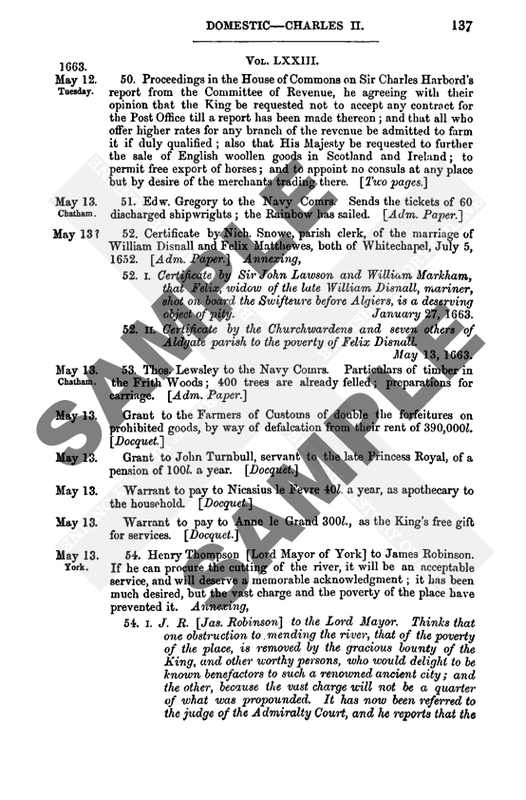 Whereas we understand that 'at the contemplation' of our letter to you dated 18 May 1578 you are now willing for the better service of her Majesty, that Mr Richard Martin, Alderman of London and Warden of her Mint, should be admitted to the freedom of the society of Merchants Adventurers, if it were not for the ill precedent might grow thereof, and specially for that her Majesty by her former letters has enjoined you the contrary ; we like both your inclination that way, and your regard for her Majesty's command. She has now written her letters of warrant to you for his admission only, her former letters notwithstanding ; but enjoins you withal that no other be hereafter admitted otherwise than by your orderly course and laws has been accustomed, nor contrary to the tenor of her letter of 31 Dec. 1559 ; which we also require you to have in such regard that the Queen's command be not broken, nor the admission of Mr Martin be drawn into 'president' for any other. 528. [THE PRIVY COUNCIL] to HODDESDON. 530. The PRINCE of EPINOY to the FOUR MEMBERS of FLANDERS. 531. JACOBUS CUNO to the QUEEN. 533. "EXTRACT out of a Letter written to the PRINCE OF PARMA." 538. SUGGESTIONS as to the CONDUCT of the WAR. 1. L'Estoile calls him d'Efle. Qy. Elz.